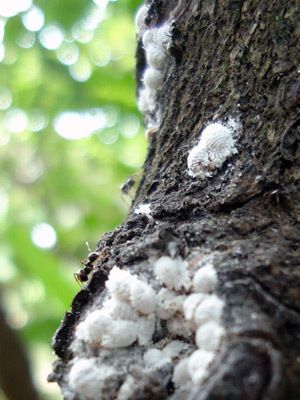 Signs - small fluffy white lumps about 5mm (1/4") appear on plants, often in the axil - where the leaf meets the stem. Leaves turn yellow and may wilt and die. There are a large number of different types which are frequently specific to the host. Usually affect house and greenhouse plants, but also Pyracantha, fruit and ornamental trees such as Japanese maples. Sticky honeydew and black sooty moulds may accompany. Despite being insects, they don't look like insects, just a shapeless piece of cotton wool. The white covering is protective and highly hydrophobic (water shedding) which means they are difficult to spray as it just runs harmlessly off them. 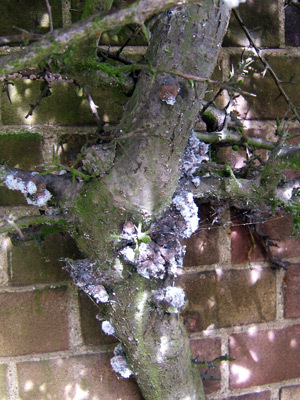 Damage - plants are rarely killed unless very heavily infested over a long period. Commonly weakened, a heavy infestation is very unsightly from the pests themselves and from the sticky honeydew that they secrete and possibly even black moulds that grow on the sticky honeydew. Root mealy bugs damage the roots (you may have seen that one coming). Treatment - difficult to attack from the outside, any of those organic soapy sprays just fall off from the hydrophobic (water repellent) hairs that cover the insects. Powder form insecticides sit on the hairs and again don't get the insect inside. In small numbers they can be squashed or picked off manually before they build up a larger population, otherwise it's biological control (the predators are hungry critters so you need a heavy infestation) or a systemic insecticide that is taken up by the plant and passed along in the sap right to the mealy bug. I've never had enough to justify the biological control approach, but often get them each year on one of my Pyracathas or Japanese Maples, I keep them in control by rubbing them off or spraying insecticide on nearby leaves - very important that, the insecticide needs to get into the plant sap so that it is taken up by the insects, spraying them directly will have little effect. There are different species which can be distinguished by the length of their tail filaments but they are all oval shaped. The most common species are the citrus mealy bug, glasshouse mealy bug and long tailed mealy bug. 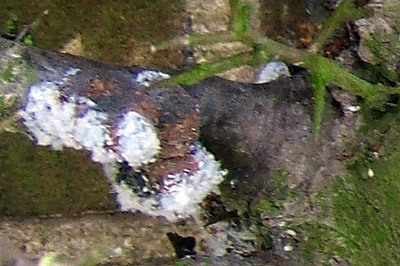 Nymphs and female adults cause damage. Most feed on higher parts of plants but some extract food from roots. Mealy bugs on a Pyracantha stem, unlike other plant pests, they are often found on woody stems where they can form small colonies looking like white cotton wool. Picture used courtesy of Obsidian Soul published under CC Attribution 3.0 Unported license. Biological control of mealy bug is with the predatory beetle, Cryptolaemus. The adults and larvae of these beetles eat the mealy bug completely. The larvae are similar in appearance to the mealy bug so be careful not to remove! The beetle should be introduced once the mealy bug are observed and a second treatment applied later to ensure the number of predators is high enough to compete with the mealy bug population.